For Easter Monday Shaun suggested that I'd make hot cross buns for the Easter party that we are going to. 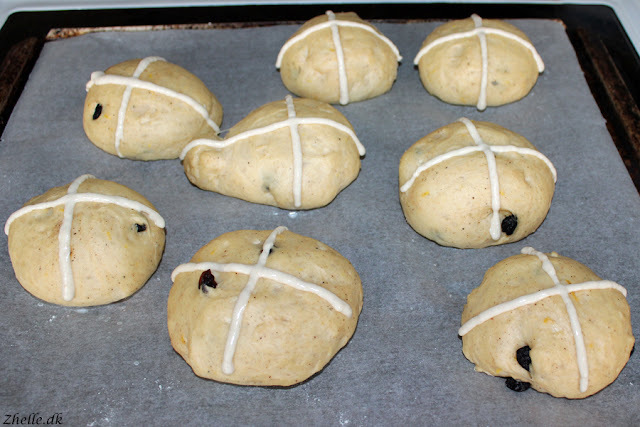 Hot cross buns are traditionally served on Good Friday and the cross is symbolising the crucifixion and death of Jesus Christ. This tradition is broken a bit with us eating them on Monday, but I think it is an excellent idea to merge some English Easter traditions with our Danish traditions. 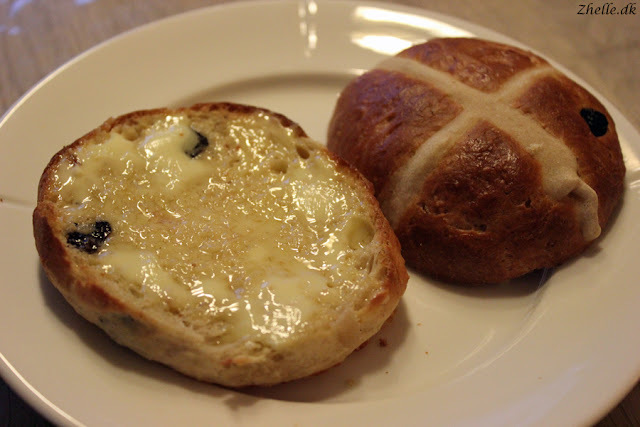 Shaun wanted me to try Mary Berry's hot cross buns, but looking through the ingredients, the use of '10g/¼oz fast-action dried yeast' made me halt. 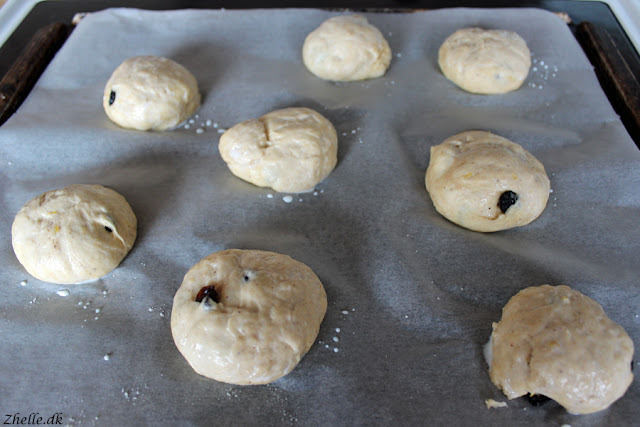 I haven't heard of fast-action dried yeast before, so instead of trying to find it or a substitute (I don't particularly like working with dried yeast in general) I decided to wait with that recipe until next year and see if I could find a Danish version of the buns. 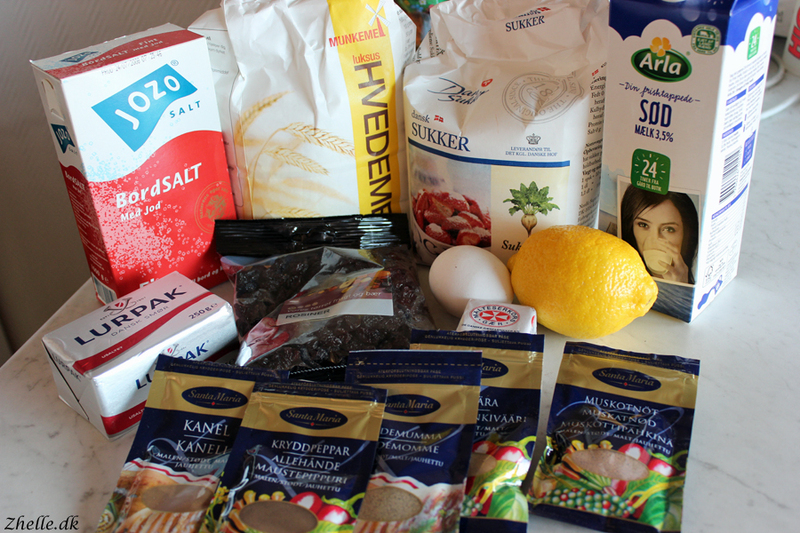 I found a Danish recipe on the blog Hvad skal vi bage? and decided to try it out. I got all the ingredients out and weight the first batch of flour, yeast and milk. 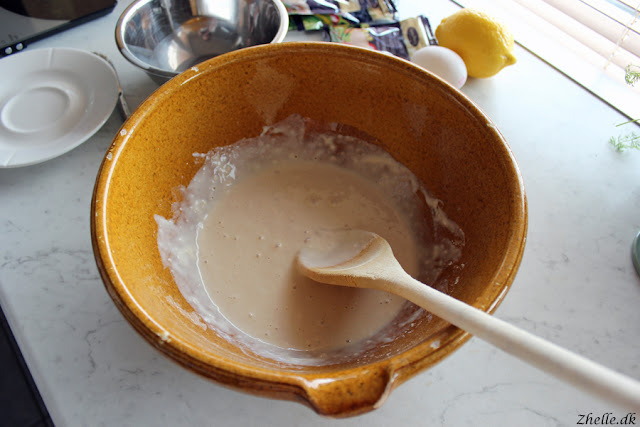 The recipe states that I should add the yeast to the flour and then the milk afterwards. 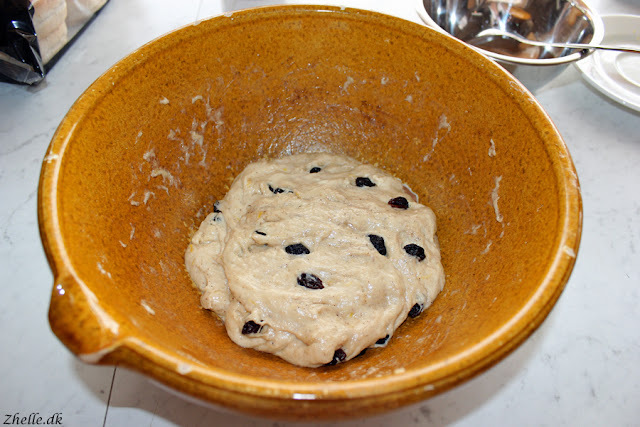 I'm looking forward to see how this turns out, as I would normally add the yeast to the milk, make sure the yeast is completely dissolved and then add the flour afterwards. While the mixture is raising for 20 minutes, I measure out the rest of the ingredients to be used and melt the butter. Kneading the dough until smooth took longer than expected, but it does end up nice and smooth. 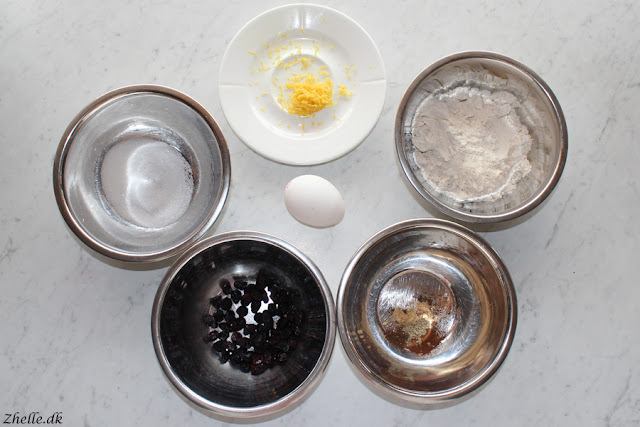 I did dip the raisins in flour after the picture was taken, but when they and the butter are added at the same time, the butter just "wash" the flour off so whether or not they will stay where they should, is yet to be seen. 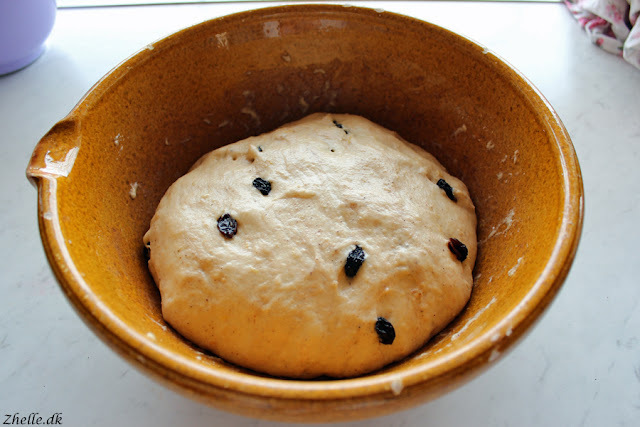 After adding the raisins it need to rise for an hour, and it is a very nice looking dough I can uncover! I am very happy with how they are looking! 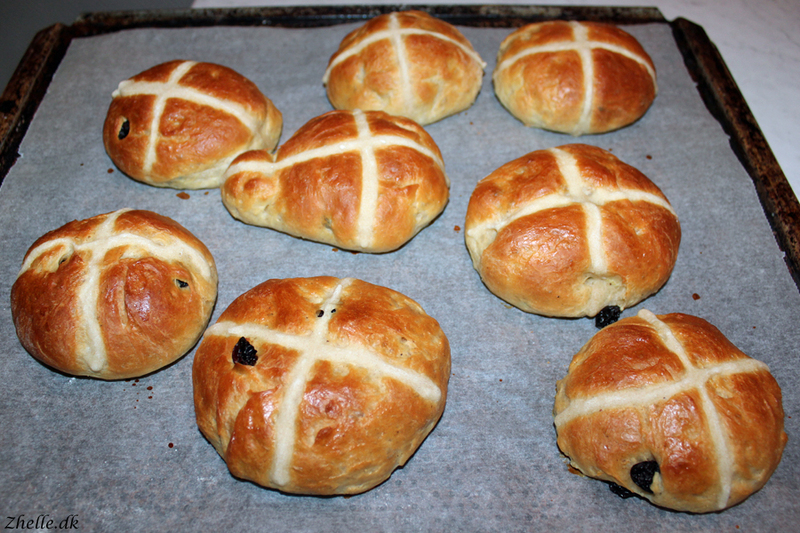 They do look like the classic hot cross buns from the pictures, so that part is definitely a success. 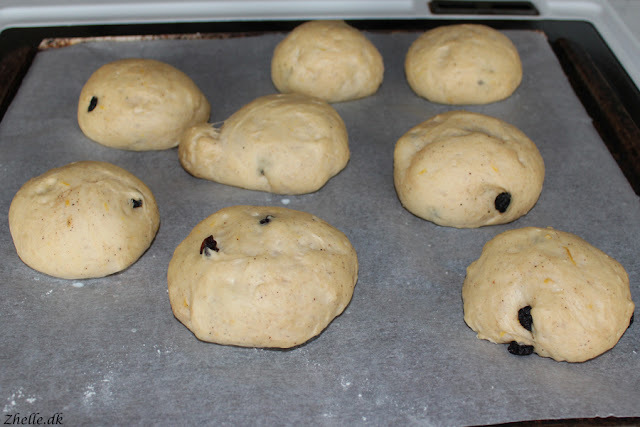 They also taste like classic hot cross buns (Shaun says, and he is British so that is as good as it gets) so that is definitely a recipe I will use again! I am very happy with it and can definitely recommend it. Jump over to Hvad skal vi bage? and try it out for yourself!